Sakai Guides and DocumentationSakai Basics Resources ToolHow do I create a zip archive file in Resources? Click Actions, then Compress to Zip Archive. Zoom: Click Actions, then Compress Zip Archive. 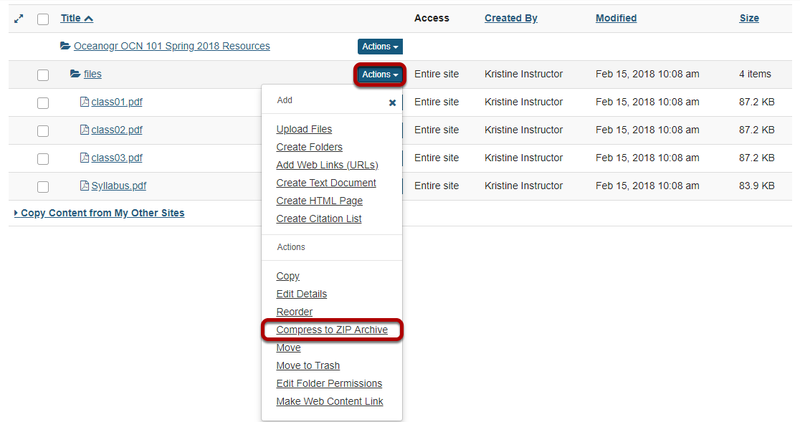 To the right of the folder you want to zip archive, from the Actions drop-down menu, select Compress to ZIP Archive. This creates a zip file. The zip file contains a copy of all of the subfolders and files inside the selected folder. Note: The zip file is named the same as the Resource folder that was compressed. By default, the zip file is placed inside of the root folder of the site. Prev: How do I upload and unpack a zip file to a Resources folder? Next: How do I add a web link or URL?